Near the end of October, 1962, the very first general topic taken up by the Council Fathers was the Sacred Liturgy, discussing an early draft of the document which would eventually become known as Sacrosanctum Concilium. 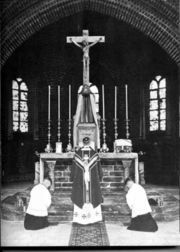 As late as1948, Pius XII had convened a Commission for the Reform of the Liturgy; a newly-revised Holy Week liturgy was im¬ple¬mented in 1955 – a fruit of the “liturgical movement” – of which most Catholics were unaware. They hoped that the liturgy of the monasteries would find its way into the cathedrals and parish churches. renewal of the Divine Office and of the Psalter were also Conciliar topics, along with a discussion of liturgical needs in mission lands. As the Council Fathers entered a brief recess from November 1st to 4th – to observe the traditional days of All Saints and All Souls, and in observance of the 4th anniversary of John XXIII’s papacy – a “renewed” liturgy was surely in their thoughts. Fidelity, the place of Sacred Scripture, heart-felt reverence, a “ressourcement” (the study of Patristics, the teaching of the early Fathers of the Church), and the recent “Liturgical Movement” would all be factors in a reformed liturgy. There would be renewal – yet it was surely intended to be renewal within tradition.